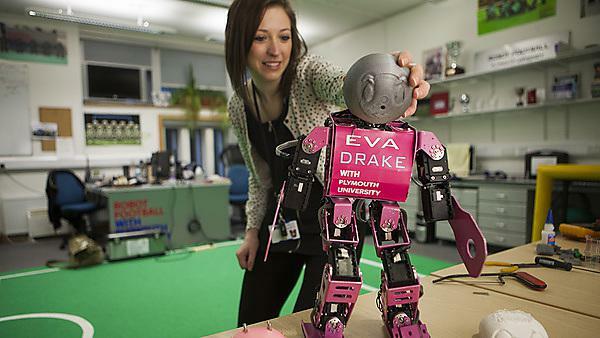 Just days before England play their first match in Brazil, University of Plymouth's robot footballers will be showing their skills to shoppers and families in Drake Circus. They will form part of a week-long showcase of the University’s exciting research, being held at venues across Plymouth and at the Natural History Museum in London. Universities Week 2014, coordinated by Universities UK and running until Sunday 15 June, features a range of events with the centrepiece being a public showcase of world class research at the Natural History Museum in London. Plymouth is the only South West higher education institution to successfully bid to attend that event, joining teams from 44 other UK universities to showcase research which has the potential to transform lives across a range of disciplines. As well as the robot footballers, the activities in Drake Circus – running from Wednesday 11 to Sunday 15 June – will include the chance for people to try their hand at dentistry thanks to the ‘Bob in the Box’ simulated head, and the opportunity to immerse yourself in a giant bubble with academics from the School of Computing, Electronics and Mathematics. From Saturday 14 June, people will also be able to visit HOT ’14 – a showcase of some of the top graduate artists at the University – and walk around the restored Drake’s Place Gardens and Reservoir. The Universities Week celebrations coincide with the Lord Mayor’s Parade and Community Open House, also being held on Saturday 14 June, with a range of colourful activities starting from the Drake’s Place Gardens. In the 2015 National Student Survey 92 per cent of our BEng Electronic and Electrical Engineering students were satisfied with their degree.